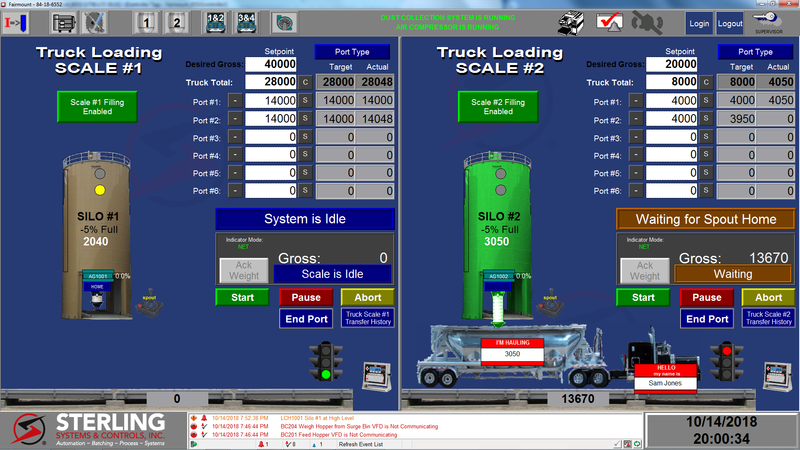 The basic configuration for a sand facility automated control system includes a customized Rockwell Automation Factory Talk machine Edition (ME) software running on a desktop PC, interfaced with the PLC Control Panel, a Motor Starter Control Panel and Sterling Systems unique SandTrack™ software with WebCentral™ remote supervisory control software application. This is typically a system used for sand drying and loading/distribution. The Sand Facility Automated Control System desktop PC with dual monitors is typically located in the facility control room, while the PLC Control Panel and Motor Starter Control Panel will be located in an electrical control room near the equipment they control. The motor starter panel can be designed for a variety of motor voltages, but the typical Sand Facility Automated Control System is designed for 480V, 3∅, 60Hz, 1200A incoming power. The motor starter control panel circuit breaker main disconnect is typically rated at 65K available inrush current rating. The required regulated voltage is 115VAC, 1∅, 60Hz is supplied by a step down transformer mounted near the motor starter control panel. The PLC control panel encloses the Allen Bradley Compact Logic PLC and associated I/O modules. MOA (manual/off/auto) selector switches, pushbuttons and indicator lights for manual operations are mounted on the front door of the control panel. The motor starter control panel encloses the circuit breakers, reversing gates/diverters, non-reversing motor starters, and a soft-start motor controller and VFD (variable frequency drive) for the feeders. The main disconnect circuit breaker provides short-circuit protection to the motor starter panels. The desktop PC running the Sterling customized software is located in an office area and communicates via Ethernet with the Allen Bradley PLC for interfacing and controlling the process equipment. 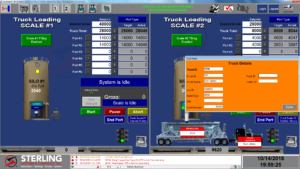 The Factory Talk ME software customization is engineered to contain graphics for rail unloading/transfer and truck filling/loading.MOA switches for running each piece of equipment in the software with indicators on the graphic screens to show equipment condition, as well as silo level status. The desktop PC will also have the SandTrack™ installed which uses SQL express database for data storage. SabndTrack retrieves and stores data for daily operation and required reports. Truck and spout positioning and filling start/stop occurs using a camera system and the desktop PC HMI screens.The operator enters the target weight into the desktop PC and the PLC controls interlocking and control of equipment during the weighment sequence. The operator can adjust operating parameters for the system using the keyboard and mouse. Some of these parameters include equipment timers and other system parameters. The software has multiple security levels so that different parameters within the software can only be adjusted by select individuals. The system has separate graphic screens for each area of operation for ease of understanding and control. The systems features object based “touch manual control”. The operator can simply touch a graphic object and a prompt will pop up that allows the object to be manually started, jogged or stopped. “Touch manual control” is a very handy feature to have in the software.